See, I said I’d try and post more – and here I am back again in less than a week! Another Saints game, this time a midweek trip to Bath for a catch-up from a January postponement. Not good to have 3 games in a week at such a crucial stage of the season. Saints made 12 changes from Saturday’s match, while Bath only made about 3. Saints had a number of top players on the bench, and they made a significant difference in the second half. 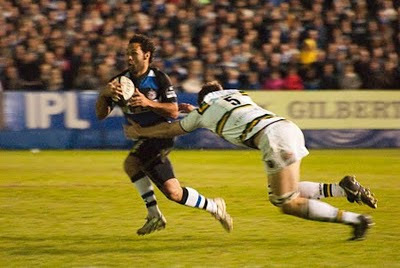 Unfortunately Bath held out 21-20, but it was a very good performance from a bit of an ad-hoc Saints side. The light wasn’t good at the Rec, so no particularly startling photos – I’ll just post up the best one.